On Friday, Jenn and I went to see the new traveling Cirque du Soleil show, Corteo. Each show has its own feel and I have liked all of them. Mystère holds a special place in my heart for being the first Cirque show I ever saw. KÀ struck me with its size and story. Dralion had a very original style. All of that given, across shows you will generally see some acts reused. The hand-to-hand, amazing as it is, shows up a couple of times. The aerial straps, beautiful to watch, also show up in a few places. Not so in Corteo. 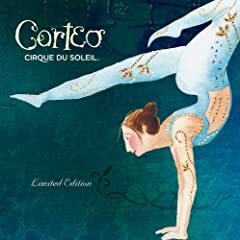 Corteo felt so fresh, so new, that I couldn’t help but leave the show feeling happy and invigorated. Everything was so amazing, so crazy, so cool, I’d have to say Corteo is my favorite of all the shows I’ve seen. It was easily worth the price of admission and I’d see it again in a heartbeat. I had never seen any of the acts before (with the exception of the aerial straps, which still felt very new) and it included one of my favorite acts, “Crystal Glasses and Tibetan Bowls,” a sampling of which you can catch on the Cirque TV show, Solstrom. I liked them all, but if I had to choose, I think I liked the chandeliers and the helium dance the best. If Corteo comes to your city, go, and feel alive again.